Abstract: This project is to develop a custom in-situ infrared (IR) microscope for high-pressure and high/low temperature FT-IR studies on Bruker Vertex 70v vacuum FT-IR spectrometer. This microscope system is specially designed with horizontal IR beam together with a ruby pressure calibration system and a temperature control system of external heater, an ideal platform for in-situ high-pressure and high/low temperature IR spectroscopic research on the properties and structures of the materials in the deep interiors of planets. High pressure and temperature IR spectra of epidote were obtained with this experimental platform to simulate and investigate its structure and water solubility under condition of the different temperature and pressure during subduction, together with mineral chemical characteristics and Raman data, to look insight into the dynamic evolution of mineral's physicochemical property and water cycle in the whole process of subduction. The data of epidote on IR spectroscopic and Raman spectroscopic research in-situ under high-pressure and high temperature show that the structure of the epidote remained stable, while temperature increasing from room temperature to 873K, pressure from 0.1GPa to 11.87GPa. In particular, the M-O bond with weak compressibility of the epidote is related to the substitution of Fe-Al on the octahedron. OH vibration spectrums in infrared spectrum are sudden increase and disappearance, which maybe related to redox of Fe. 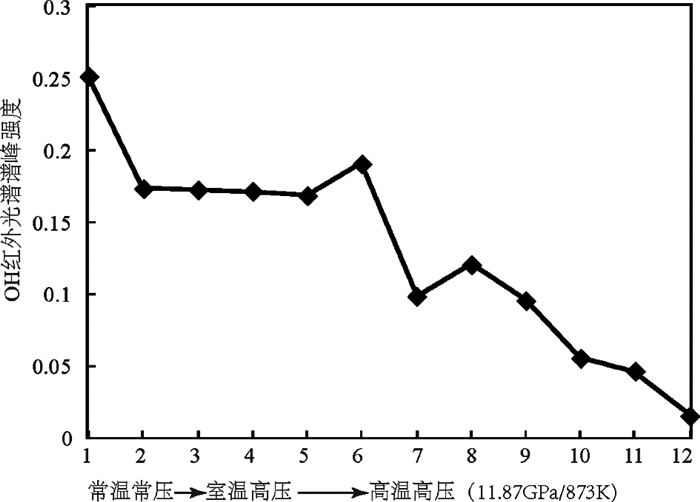 Our results demonstrate that epidotite can be stable at least within the range of P=11.87~12.73GPa and T=773~873K. Therefore, epidotite, as hydrous mineral, could have carried water into the mantle. Belov NV and Rumanova JM. 1954. The crystal structure of epidote. Trudy Inst. Kryst. Akad. Nauk. SSSR, 9: 103-164. Braithwaite JS, Wright K and Catlow CRA. 2003. A theoretical study of the energetics and IR frequencies of hydroxyl defects in forsterite. Journal of Geophysical Research:Solid Earth, 108(B6): 2284. Carbonin S and Molin G. 1980. Crystal-chemical considerations on eight metamorphic epidotes. Neues Jahrbuch fur Mineralogie-Abhandlungen, 139: 205-215. Della Ventura G, Mottana A, Parodi GC and Griffin WL. 1996. FTIR spectroscopy in the OH-stretching region of monoclinic epidotes from Praborna (St. Marcel, Aosta Valley, Italy). European Journal of Mineralogy, 8(4): 655-665. Du JG, He DW, Gao XC, Gong ZZ, Wu XY, Zhou WG, Wang DJ, Zhai SM, Ji GF and Wei DQ. 2011. Experimental and Theoretical Studies of Mineral and Rock at High Pressure and Temperature. Beijing: Seismological Press. Enami M, Liou JG and Mattinson CG. 2004. Epidote minerals in high P/T metamorphic terranes:Subduction zone and high-to ultrahigh-pressure metamorphism. Reviews in Mineralogy and Geochemistry, 56(1): 347-398. Heuss-Aßbichler S. 2000. Ein neues Ordnungsmodell für die Mischkristallreihe Klinozoisit-Epidot und das Granat-Epidot-Geothermometer. Munich: Habilitationthesis: 105. Langer K and Raith M. 1974. 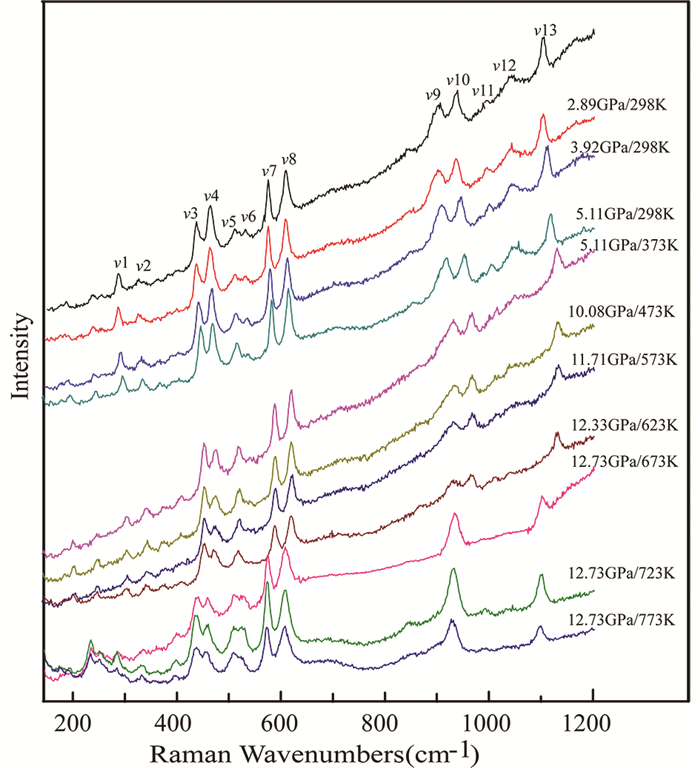 Infrared spectra of Al-Fe(Ⅲ)-epidotes and zoisites, Ca2(Al1-pFe3+p)Al2O(OH)[Si2O7]. American Mineralogist, 59(11-12): 1249-1258. Langer K, Abu-Eid RM and Anastasiou P. 1976. Absorptionsspektren synthetischer Piemontite in den Bereichen 43000~11000cm-1 (232, 6~909, 1nm) und 4000~250cm-1 (2, 5~40μm). Zeitshrift fur Kristallographie, 144: 434-436. Liebscher A and Gottschalk M. 2004. The T-X dependence of the isosymmetric displacive phase transition in synthetic Fe3+-Al zoisite:A temperature-dependent infrared spectroscopy study. American Mineralogist, 89(1): 31-38. Poirier JP. 2000. Introduction to the Physics of the Earth's Interior. Cambridge: Cambridge University Press: 63-109. Taran MN and Langer K. 2000. Electronic absorption spectra of Fe3+ in andradite and epidote at different temperatures and pressures. European Journal of Mineralogy, 12(1): 7-15. Tateyama H, Shimda S and Sudo T. 1977. Estimation of K-O distance and tetrahedral rotation angle of K-micas from far-infrared absorption spectral data. American Mineralogist, 62(5-6): 534-539. Tokiwai K and Nakashima S. 2010. Dehydration kinetics of muscovite by in situ infrared microspectroscopy. Physics and Chemistry of Minerals, 37(2): 91-101. Zhang M, Redfern SAT, Salje EKH, Carpenter MA and Wang L. 2010b. H2O and the dehydroxylation of phyllosilicates:An infrared spectroscopic study. American Mineralogist, 95(11): 1686-1693. 杜建国, 贺端威, 高春晓, 龚自正, 伍向阳, 周文戈, 王多君, 翟双猛, 姬广富, 魏冬青. 2011. 矿物岩石高温高压实验与理论研究. 北京: 地震出版社.